Once If You are Able To Program A Design For Yourself by editing Iceblue Basic Design or any of the basic design at OFW.You Are Ready For The Tutorial otherwise i advice you that you should have knowledge about html programming not all but what i say is little bit thats all what is required here. Details:Once You Have Choosen A Template From The Site Download It.The File would be In A Zip Format extract all files of the Zip one. Details:Once You have unzipped the file search for a file with the name "style.css" in the template folder. Now What You Have To Do Is Upload THe Images! 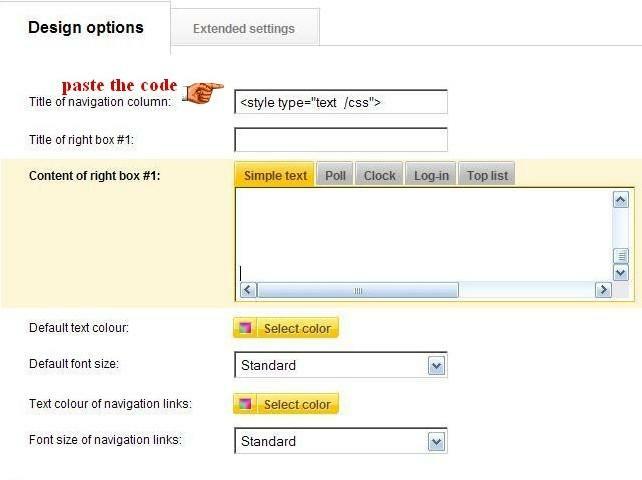 Go To Css Code WIthout Style Tags Where you had paste the code! ok now you have to do two works at A Time! Now What You Have To Do Is On Pictures.pk upload an image(You Will Find The Images IN The Images Folder of The Css Template) and then find the name of the image in Css Code! and with the find facility type "button.gif" and then it would find the image erase "button.gif " and paste the image url where it is present! Well Now What You Have To Do is Do This Thing To All THe Images until all images are uploaded and their image url is pasted in the Css Code Without Style Tags! Well Please Dont Forget To Paste This Necessary Code In Each And Everypage "Source Code" You MAke if you wont The Page Wont Show Up! But Remember The Index File Code Should Be Beneath The Necessary Code. When You Have Edited One Page..lastly save! and then just open your website and see that your website is really worth something!!! When you have done all the steps please view your website has the design been uploaded alright?? if not then go to Edit Design.......Extended Settings......paste the following code at text at top of page! as it is A Little bit difficult to handle when you have to make so many pages and then paste the necessary code all the times! Please MAke Another Website To Check The Design and Make Many Tests and you will surely master this technique as i had!!! Some Of The Sites I Had Made On Css Template Look At Their Design! Today, there have been 4 visitors (118 hits) on this page!